Edward L. Platt describes himself as a "a web developer, maker, artist, recovering physicist, and neuroscience fanboy." I met him at Maker Faire Detroit, where he had an exhibition of his geometric snowflake drawings, called "penflakes." He told me he draws one by hand every day. He uses hex grid paper as a template, laying a piece of plain paper over it. I asked him why he does this, and I *think* he told me that once he saw a drawing of an 8-sided snowflake, and decided to draw a 6-sided one as a way to correct the error. He found the activity so rewarding that he has drawn one every day for the last couple of years. I find his drawings beautiful. 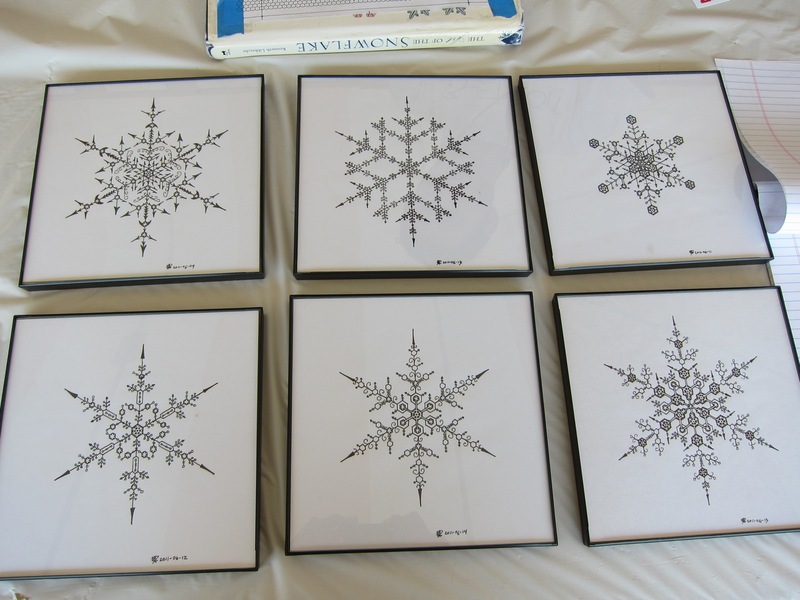 Edward has created a Web-based application that allows people to draw their own snowflakes. I prefer Edward's old school pen-and-paper method, but the app is fun to play with! It's called FlakePad.